Daisy Sewid-Smith and Martine J. Reid translated and transcribed the verbal memoirs of Sewid-Smith's grandmother Agnes Alfred (c. 1890-1992), a non-literate storyteller of the Kwakwaka'wakw First Nation who was jailed for her participation in a potlatch in 1922. 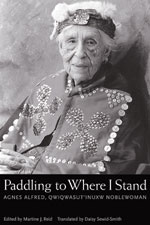 Their three-way collaboration entitled Paddling to Where I Stand, Agnes Alfred, Qwiqwasutinuxw Noblewoman (UBC Press, 2004), is the first autobiographical portrayal of a Kwakwaka'wakw matriarch. Few birth records exist for First Nations children born in the 1800s, but it's known that Agnes Alfred was born early in the last decade of the nineteenth century and she lived for more than 100 years. Her birth was recorded on a rock on Village Island. Alfred's age and her position as a Qwiqwasutinuxw noblewoman meant she had access to a vast store of traditional knowledge. She did not speak English and she had no Western education, but she had developed extraordinary skills in remembering and storytelling, as well as in memorizing myths, chants, and historical accounts. Thus Agnes Alfred, who was forced by her family to convert to Christianity as a child, later took upon herself the task of passing her traditional knowledge to younger generations. In a chapter entitled "Myth Time,"; for instance, she tells stories such as that of the girl who is dragged into the underworld to live among the Halibut people. This girl is retrieved years later by reaching for one of her father's halibut hooks, and so returns to her parents. Women such as Agnes Alfred also functioned as mediators between the natural-human-profane realm and the supernatural-sacred realm. Agnes Alfred's transmission of her knowledge might have remained in the realm of the oral, and possibly have been lost, had it not been for collaboration between the French-born anthropologist Martine J. Reid and the matriarch's granddaughter, Daisy Sewid-Smith, a Kwakwaka'wakw language instructor at the University of Victoria. After Reid came to UBC as a French Ph.D student in 1975, she began to participate in a program to preserve the heritage of aboriginal peoples-and that led her to "Mrs. Alfred. "; When Reid met Agnes Alfred, she was a widow of about eighty, but still independent and living alone in the big house built by her husband for her and their thirteen children in Alert Bay. It was her habit during the fall and winter to make a cycle of pilgrimages to visit her many relatives and descendants in Campbell River and elsewhere. As the friendship grew, Reid would accompany her on those annual visits, and thus she met Daisy Sewid-Smith, who had long been fascinated by her Aboriginal culture. These three women eventually formed a trusting partnership-with Mrs Alfred dictating her memoirs, Daisy Sewid-Smith acting as translator, and Martine Reid transcribing and editing. The end result is a volume that defies easy categorization. It is an academic work, but the scholarly apparatus never overwhelms or drains the vitality of the subject. Agnes Alfred's voice-by turns authoritative, humourous, poetic, and gnomic-rings out clearly. "Poor me; I was married at such a young age.... They sailed away with me right away, and they brought me to this logging camp.... I had not even menstruated yet. I was perhaps only twelve or thirteen. I was really young. I was married for quite some time before I menstruated. "; The chapter entitled "Becoming a Woman,"; describes the onset of menstruation and an elaborate ritual that marked her passage into womanhood. She was secluded from the rest of her household for twelve days, concealed by a curtain in a corner of a room. During this time, she sat (wearing the hat reserved for nobility), and was cared for by her mother and the tribal elders. Besides the formal chapters, the editors have included a lively section of "Fragments of Recollections. "; These include such varied topics as "My First Baby Buggy,"; "My Washing Machine,"; and "I Dye My Hair. "; The baby buggy was never used because "it looked so dreadful;"; the washing machine was so overloaded that it toppled over and sent the wringer rollers scattering all over the floor; the hair dye, mistakenly applied like hair oil, dyed her hands black. Paddling To Where I Stand reveals that noblewomen played a significant role in their society beyond the perpetuation of lineages through child-bearing. Their dowries supplied men with very valuable privileges; both in tangible goods and in prestige, and the power and standing of the men were often derived from their wives. Besides a preface, introduction, epilogue and footnotes, Paddling To Where I Stand has five appendices. These provide such information as a linguistic key to the alphabet, spelling, and pronunciation of the many words in the text written in the original language of the Kwakiutl people; an account of the potlatch ceremony and the events surrounding its prohibition; and diagrams showing genealogy and kinship. "WE WERE NOT PERMITTED TO SHOW OUR FACES IN PUBLIC. WE WERE NOT permitted to walk around, the K'ik'i'yala [virgins]. We would be punished even if we just looked out of the house just peeked out. There is a lullaby for Wikalalisamega. They would slap her legs if she showed her face in public. Even if she just looked out those are the words of the lullaby. We were told that certain young men would make noises outside the houses. You know how some young men are? They would do this to attract the young virgins.Those that ran out to them were considered to be bad. The reason for all the noise was to attract the young virgins, who were not permitted to show their faces. I played outside when I got older. It was never permitted when I was young. It is difficult to make you understand now." --Agnes Alfred, born in 1889, raised in Alert Bay and Village Island.